Janet MacKenzie (centre) and Jeanne Kusch (right) travelled to Russia for the Innovative Learning Institute. When nursing student Janet MacKenzie heard about an opportunity to enhance her education with a trip to Yakutsk in Russia’s Far East, she leaped at the chance. "I saw it as an opportunity of a lifetime," said MacKenzie, explaining she had to talk it over with her husband and three children before deciding to apply for the two-week Innovative Learning Institute in Northern Nursing Education in summer 2015. "My family was supportive… I wanted to be able to tell people that I travelled to Russia and that I saw what health care looked like in that part of the world." MacKenzie knew it was a great learning opportunity; what she did not expect was that her learning experience at the U of S would be of such great interest to her counterparts in Russia. MacKenzie, a member of the Lac La Ronge Indian Band from Stanley Mission, is part of pioneering efforts by the U of S College of Nursing and its partners to bring professional education to the North—efforts that are proving to be applicable throughout the circumpolar region. Lorna Butler, former dean of the College of Nursing, explained that nursing in the North faces challenges recruiting and retaining qualified locals. Teaching in the North requires faculty, who are mostly from the South, to appreciate new different ways of knowing and ensure the program is locally relevant for students and their future clients. Recruiting nursing students from the North poses its own challenges, not the least of which is geography. Covering about half the province's land mass, Saskatchewan's Northern Administration District is home to roughly 37,000 people in about 45 communities. The college's Learn Where You Live initiative in northern, rural and remote communities helps northern communities access its undergraduate program. Creating learning opportunities close to home has led to much student success, with many graduates entering the local workforce in their home communities. Delivery of the full nursing degree program to La Ronge and Île-à-la-Crosse includes lectures through videoconferencing as well as clinical training with the use of remote presence technologies (robots). The robots are operated from Saskatoon and move freely around the room in La Ronge or Île-à-la-Crosse. Cameras and sensors allow the professor to control the robot remotely, working side-by-side with students. "They (faculty) maneuver around with the robot as if they were actually there," Butler said. "It's like a person walking—you become the face of the robot there and you move around the room with the students." Butler, now the senior strategist, distributed and technology enhanced learning and discovery, emphasized the remote learning model they have developed is only successful because of close community involvement. For example, the leadership of North- lands College, based in La Ronge, the CEO of the Keewatin Yatthé Health Region, and the mayor of Île-à-la-Crosse were all part of the team to launch the program in that community's hospital. "In the North, by the North, for the North," she said. "The families in Île-à-la- Crosse are so supportive of the students who attend class there. For example, on the first day of clinical they all came to see the students in their uniforms," Butler said. The innovative approach also impressed MacKenzie's Siberian counterparts when she visited Yakutsk with her classmate Jeanne Kusch from Île-à-la-Crosse. "The student nurses… were eager to hear about our nursing program in the North," she said. "They were especially impressed to know we did our lectures by distance with our instructor being almost 400 km away." MacKenzie explained that language was an obstacle, but an interpreter eased the way as they attended lectures on Yakutian history and culture, economic development and public health topics such as tuberculosis in children and adults. 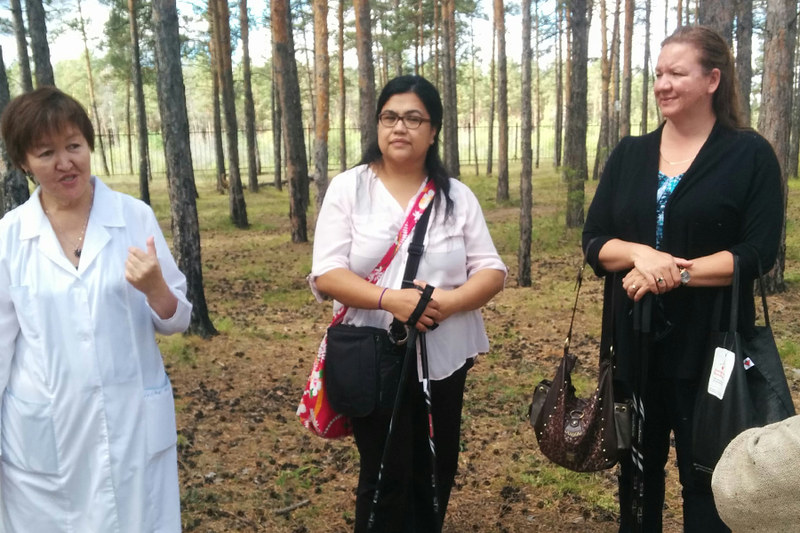 "I was really surprised that they still had TB sanatoriums in Yakutsk and they were equally surprised that we did not," she said. Butler and her colleagues on both sides of the Pacific have already begun to bring the telepresence model to Yakutsk, with one robot in the local hospital accompanied by an interpreter to bridge the language barrier. She explained the cutting-edge approach is instilling a sense of pride in the local nurses, who have begun to see their work as a profession. "Most of the things we're doing there would happen in Moscow or St. Petersburg, not in Siberia," Butler said. "So things that are happening there are unique to their university and it has really changed how nursing is viewed." It is also a model that Butler and her team are working to expand throughout the circumpolar region. The team reached out to the International Centre for Northern Governance and Development at the U of S for help. Leveraging their involvement with the University of the Arctic, they created the Northern Nursing Education Network. The network co-ordinates education and research in circumpolar countries. One such activity will be a delegation of 10 students from Yakutsk, Finland, Norway, Greenland, Iceland and Canada coming to the U of S in August 2016. As for MacKenzie, she said her education may continue with nurse practitioner training, or she may begin her career as a registered nurse this year upon graduation. Whatever her choice, it will be in the North, for the North. "I want to remain in the North as I have lived here all my life and this is where I want to work," she said. "If I happen to gain employment in a place other than my hometown, then I will certainly talk it over with my husband and children and we will make that decision as a family."